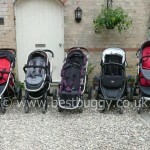 The B-Dual being huge (if you look closely you will see the B-Dual is one of the neatest pushchairs there and also the hood is a very similar height when up to most of the rest). 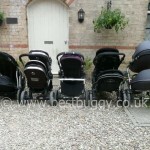 The City Select being long (its one of the smallest tandems in this line up because the front seat sits right on the front wheel, and there is no overhang at the back). 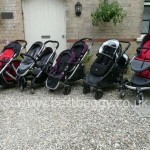 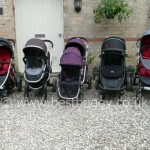 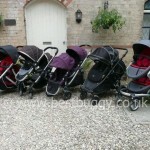 Just to add the pushchairs are lined up pretty equally along the back axle lines, and all the handles are at the height at which I would use them (I am 5ft 6 ins).